Marine Debatte, BI Worldwide's head of events, Asia Pacific Japan/China, runs through her favourite venues in the Asian city state. I love Singapore. We held an event in 2014 for a European car maker, where the group discovered Little India and Chinatown with its culinary wonders and experienced excitement at Universal Studios Singapore at Sentosa. Gardens by the Bay offers surprises for even the most seasoned travellers. 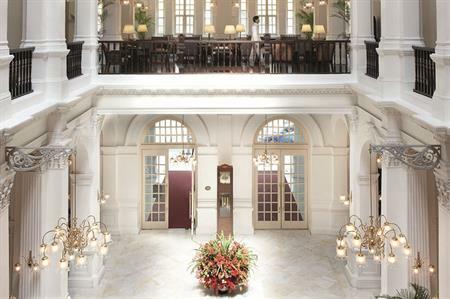 Raffles Hotel (pictured) offers refinement and discreet luxury, colonial architecture and personalised service. The Long Bar, where the Singapore Sling was first created, provides a great atmosphere. The Fullerton Hotel is a one-of-a-kind venue set in the heart of the central business district. Each room is exquisitely decorated, illustrating superb heritage as well as offering spectacular views. The Fullerton Bay is a newer option where you can enjoy lunch within a highceilinged, open space overlooking the water. For first-timers and younger groups, Marina Bay Sands is ideal. Facilities include bars, restaurants with celebrity chefs, a casino, entertainment, amazing conference and meetings spaces and the highest infinity pool in the world. There are many options, depending on group size: for conferences, Marina Bay Sands brings it all together; Suntec City impresses with a gigantic screen at the entrance; and for very large groups, Star Theatre is stunning. For large groups, we recommend a private booking of a hawker centre. Lau Pa Sat is a great choice. Alkaff Mansion, which serves Italian food, is a beautiful colonial house on top of a hill. Jing Restaurant faces Marina Bay Sands and serves Chinese cuisine, such as chilli crab. Singapore nightlife is all about rooftops: the easiest option for small groups is Club Street. Others include Ce La Vi on top of Marina Bay Sands, or the Fullerton Bay Hotel terrace, for cocktails and stunning views. An indoor favourite would be Altitude and Manhattan, at Regent Hotel - book early. Chijmes offers bars, cafes and restaurants around a 19th-century former chapel. Smaller groups can try Dempsey Hill, with its gourmet cafes and bars offering great seafood.